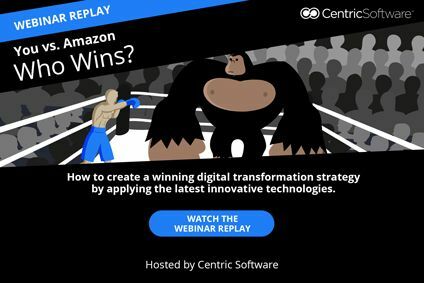 Webinar replay: You vs Amazon – Who wins? There will always be a competitive threat; someone bigger than you or has more resources. We all know that the market has changed and that this change will continue. But this doesn’t mean that you can’t compete, and that you can’t win. You can – brands and retailers are doing it now by executing digital transformation strategies and adding new digitally native ways of working. Join Centric Software's CMO, Anastacia Charbin, and Head of EMEA Sales, Christophe Therrey who will explore ways leading brands and retails are applying innovative technologies like touch screens, mobility, artificial intelligence, APIs, micro-services to support business strategies like getting closer to consumers, increasing product innovation and variety, offering made to measure, becoming agile while encouraging internal experimentation and boosting employee happiness & loyalty. Silicon Valley-based Centric Software is the market leader in PLM and digital transformation technologies for AFA markets with 250 customers who develop and produce for 600 brands around the world.